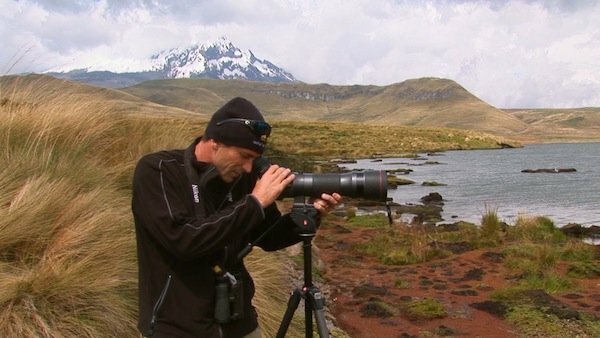 Birding the High Andes is no joke. If, like me, you have trouble breathing at sea level, consider bringing an oxygen tank. Florida, where I currently live, is many things. But high is not one of them unless you’re referring to a large percentage of the population. So, having been to Ecuador before, I knew that a few days in Quito and surrounds would be good for the old lungs before embarking on our quest for Seedsnipe. But even a week of acclimation and gallons of coca tea could not prepare me for life at 14-15,000 feet. Seedsnipes are some of the world’s oddest birds. Their exact taxonomy is uncertain. Some suggest they are related to the Plains Wanderer of Australia. Others have suggested an affinity with jacanas and even Painted Snipes. What we can agree on is that they do not fit the shorebird stereotype. For these misfits of the shorebird world resemble grouse, partridge or even francolin rather than typical shorebirds. Also, unlike other shorebirds, they are herbivorous. There are four species of seedsnipes (Thinocoridae) and all are endemic to the Neotropical region, including Patagonia and the Andean zone. The four species are split equally into two genera, Attagis and Thinocorus (sounds like a dinosaur, doesn’t it?). We were in quest of the largest of all, an attagis called the Rufous-bellied Seedsnipe. The upper reaches of the Andes is a harsh place. No doubt. But I was surprised by the diversity of life up here. To adequately experience the environment it is important to bird both the wet and dry paramo (grassland) of the upper Andes. Antisana is one of the better examples of dry paramo and is an excellent spot to nail down a whole bunch of signature high altitude species like Andean (Black-faced) Ibis, Carunculated Caracaras, Silvery Grebes, Andean Teal, Andean Gulls, Paramo Ground-tyrants and Andean Lapwings. And then there are birds with fantastical names like canasteros and cinclodes that eke out a living in this rarified atmosphere. Papallacta Pass, an example of wet paramo, is one of the best sites for Rufous-bellied Seedsnipe and is only an hour’s drive from Quito. But the birds are more often than not found at 14-15,000 feet in this general area. This is not a problem if the birds are around when you drive up to the radio antenna at the top of one of the peaks. It is another thing entirely when you spend several hours walking the peaks spluttering like an old car. I had literally given up and left my videographer Jeff and our Tropical Birding guide, Jose to search for the birds. I remember asking Jeff if he felt sick and his attempt at humor did not go down well. “I’m 6 ft 10 so I’m used to altitude. Being really tall has its advantages” was his ridiculous reply. I’m normally the last to quit searching for a bird and have frustrated many a cameraman and guide in my, often unreasonable, determination. But on this day I was done. The early signs of altitude sickness had taken their grip on my body due to the hours of physical exertion. I went back down to the car and walked even further down the slope to get to lower altitude. I found a nice soft patch of ground and closed my eyes. Awesome, James!! Renato, David, and I had the same experience at Papallacta, trudging along like zombies without finding the seedsnipe. It wasn’t until we left that we spotted a pair from the van. The paramo was one of the most memorable and weird habitats I’ve ever visited. Awesome post. You sum up a typical Rufous-bellied Seedsnipe search perfectly! I also have problems at those oxygen-depleted high elevatons and have missed magical things like Diademed Sandpiper-Plover because of it. They always suggect cocoa leaf tea but that doesnt work near as well as coca leaves wrapped around lime. In fact, that is the only thing that worked for me when birding the high elevations of Huascaran Park, Peru. @Mike: yes it’s absolutely fantastic. I’ll be bringing oxygen next time. @Pat: Thanks for that advice Pat. Will try it next time. @Geoff: Dont tell Keith that – unlucky bugger!